We employ a litter warden who clears litter on a weekly basis from particularly important areas of the parish, including the childrens’ playgrounds. If you notice any problems with litter in the parish, please report them to the Clerk. Every year in the Spring we organise an annual Village Tidy, where teams of volunteers spend a couple of hours helping to clear litter from areas (particularly road verges) that are not part of the weekly schedule. For our 2016 village tidy on Saturday 5 March we joined with the national Clean for the Queen scheme – linked to the Queen’s 90th birthday. Our volunteer teams were joined by local MP Nick Herbert and collected a large quantity of litter. Click on the picture below for further media coverage of the 2016 Village Tidy. THERE’S NO SUCH THING AS THE POO FAIRY! Residents report that this is still a problem. Irresponsible owners continue to ignore the signs and leave dog mess in the playground, sports field, paths and pavements. Horsham District Council’s Street Scene Team are therefore making arrangements to spend some patrolling time in Thakeham over the forthcoming weeks and where necessary will issue £50 Fixed Penalty Notices to offenders. It is especially important not to let your dog foul in children’s playground areas – or to put bags containing dog waste in the litter bins in those areas. Thank you for your help in keeping Thakeham a pleasant place for all to walk and play. “Adopt-a-Street” and make a difference in your area. If you take an interest in your local area and wouldn’t mind putting in some extra care to see it looking clean and tidy you may wish to join this scheme run by Horsham District Council. The scheme provides equipment such as litter pickers, plastic bags and gloves to help with the clean up. Basic health and safety training as well as help to co- ordinate volunteers is provided. The parish has several roads and tracks adopted already (for instance, Bramble Lane and Woodland Way have been adopted by the children of Thakeham First School). It is a great way to help make a big difference in your area and helps build strong community spirit. Unfortunately this is a regular issue in Thakeham as elsewhere. 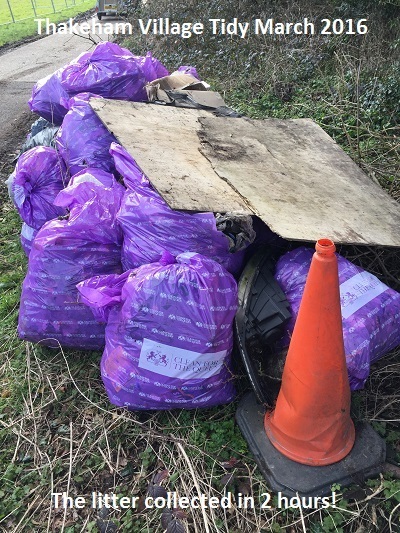 If you encounter a case of fly tipping, please report it to Horsham District Council via this link.